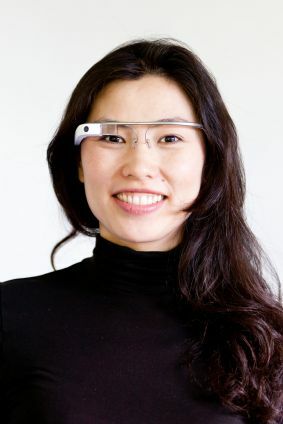 Synopsis : Article looks at some of the future uses of the Google Glass project as an aid for persons with disabilities. Google Glass is a wearable computer with an optical head-mounted display that is being developed by Google in the Project Glass research and development project, with a mission of producing a mass-market ubiquitous computer. Google Glass displays information in a smartphone-like hands-free format, that can communicate with the Internet via natural language voice commands. A type of wearable computer created by the Google's Project Glass. The glasses provide augmented reality for users by visually connecting them to an Android-run heads up display that offers many of the features of an Android smartphone and connects users to many of Google's key cloud features, such as maps, calendar, Gmail, Google+ and Google Places. The Google Glass operating system is based on a version of Android, and it can run apps called Glassware that are optimized for the device. The glasses have built-in Wi-Fi and Bluetooth connectivity and a camera for taking photographs and videos. Google glasses are not the same as Google goggles. Google Goggles is a separate project from Google that uses images, rather than text or voice commands, to conduct a search. A touchpad is located on the side of Google Glass, allowing users to control the device by swiping through a timeline-like interface displayed on the screen. Other than by the touchpad, Google Glass can be controlled using "voice actions". To activate Glass, wearers tilt their heads 30 degree upward (which can be altered for preference) or tap the touchpad, and say "O.K., Glass." Once Glass is activated, wearers can say an action, such as "Take a picture", "Record a video", "Hangout with Bill", "Give me directions to Times Square", and "Send a message to Sally". For search results that are read back to the user, the voice response is relayed using bone conduction through a transducer that sits beside the ear, thereby rendering the sound virtually inaudible to nearby people. Google's Glass headset, which connects to users' smartphones and displays information on a screen that hovers above one eye, is the first of what analysts say may be a new trend of wearable technology - headsets, watches, fitness trackers and other devices that are worn, rather than slipped into a pocket. For someone living with a disability, the futuristic gadget is far more than a toy. For example, speech recognition is getting so good that a deaf person soon could see a real-time transcript of what a friend is saying in Glass' prism. A person with limited vision could take walking directions from Glass through its bone-conducting speaker housed in the right temple. It has been reported Google is paying close attention to how people are using Glass. At Georgia Tech, the company is working on two projects aimed at finding Glass applications for those with muscular dystrophy and Parkinson's disease. A collaborative effort between researchers at Carnegie Mellon University and the University of Rochester focuses on using Glass to help the blind. A new technology has been developed which uses Google Glass to help people with autism make eye contact, engage in conversations and be able to read social situations and cues more easily. Ned Sahin, a Boston entrepreneur and scientist, has developed a new technology that aims to change the way those with autism see the world. "The Brain Power system adds enhancements to the Google Glass or other wearable (technology) and then a suite of software," Sahin said. The software was designed to help those with autism make eye contact, engage in conversations and more easily read social situations. "It coaches eye contact directly, rewarding points to the child or adult with autism. Then, when they look at someone in the eye, their little computer screen shows the emotions the other person is feeling," Sahin said. The glasses can help make someone relax by playing soft music and even has a solution to the fear of "wandering", wbir.com reported. "A Mom can speak to her child through the device and actually see what he is seeing," Sahin explained. "We activate the camera so it becomes a remote version of her eyes." Clinical trials for the new technology will begin later this year at Harvard Medical School.